The all meat hot dog is great for kids of all ages. No parts or pieces in our dog. Enjoy over the fire or the stove. 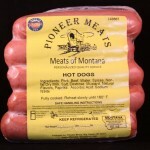 Award winning year after year from Pioneer Meats in Big Timber, Montana.